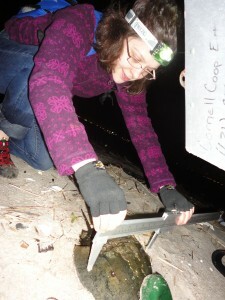 Since early May, if you visited a beach in Jamaica Bay on a night around the full or new moon at high tide, you might’ve run into an intrepid band of NYC Audubon volunteers counting horseshoe crabs in support of our citizen science project in the bay. On June 21st we completed our last surveys of the spring/summer and the data indicate that spawning peaked earlier this year than in previous years, potentially due to our mild winter and spring. In addition to counting crabs, the volunteers tagged more than 700 individuals, which help illuminate movement patterns and longevity. We are in the process of analyzing the data, as well as the information that our shorebird monitors collected on migratory shorebirds in the bay. Thanks to all our volunteers who worked so hard to collect data over these past couple of months! 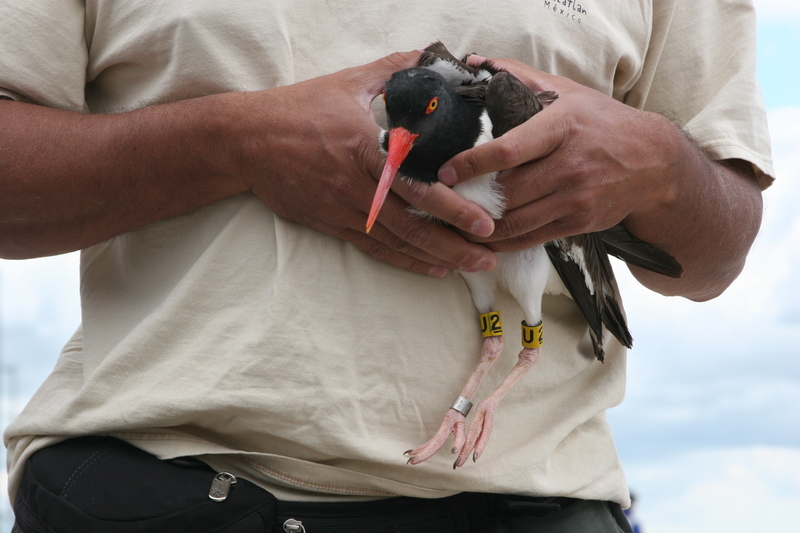 For the first time, American Oystercatchers have been banded in New York State! On Tuesday, June 5th, we took a team to the Arverne area in Far Rockaway to band this beautiful and threatened shorebird. Oystercatchers nest on the beach in a scrape in the sand and at Arverne they nest in full view of the many beachgoers who enjoy the beach. The Urban Park Rangers protect their nesting sites by roping off the areas where the birds nest and patrolling the beach. Working with Shiloh Schulte from the Manomet Center for Conservation Science and Urban Park Rangers staff, we netted five American Oystercatchers, placed identifying bands on them and took some physical measurements. These data will add to the regional effort to understand and protect the species along the Atlantic Coast and we’re excited that New York is now part of this larger effort. If you’re on a beach in the Rockaways, keep an eye out for our banded birds!